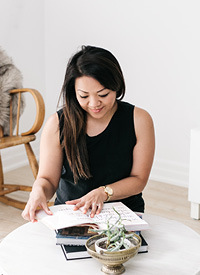 Custom Name Art — Love On Sunday Love On Sunday | Interior Styling in Toronto and the GTA. Happy Hump Day! Today I wanted to share a present I made for a very dear girlfriend, Kristen. Her daughter celebrated her 1st birthday this past saturday and I wanted to create something that both her and her daughter could keep for years to come. Custom name art for the nursery! Kristen is a crafty lady herself so I knew she would appreciate something homemade and girly. I decided to go with a pale pink to match her baby girl's bedroom. I purchased two white frames and created a design to fit within the matte of the frame. The first frame spells her daughters name, Alannah. The second frame is a placeholder waiting for the perfect photo from her birthday party. I thought this would be the perfect keepsake for little Alannah. And here is the princess herself on her special day. Isn't she adorable? Can we talk about this sweet table? It was created by Kristen FROM SCRATCH! Can you tell this lady's got skills? She made the cake, the cupcakes, the cream puffs, cake pops, personalized tags and wrappers...pretty much everything you see on this table. Funny how my name art matches the colours on this table. I told you she loves pink!